My anipals know that I LOVE cookies. 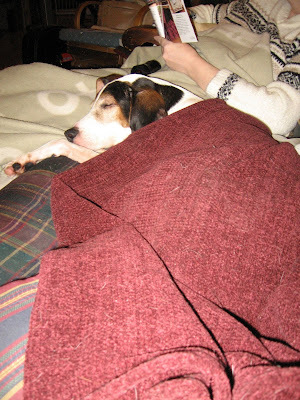 But less well-known is my love of blankies. 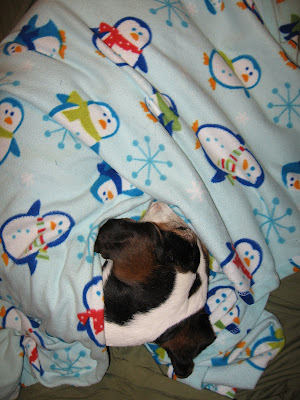 Three years ago I decided to begin a longitudinal study of blankies. 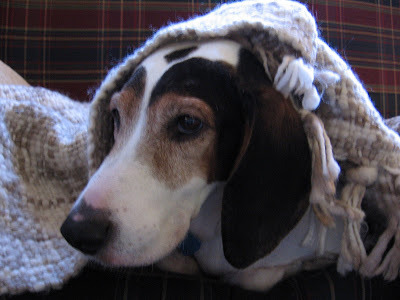 Blankie 1.1: can blankies be worn as hats? Answer: yes. 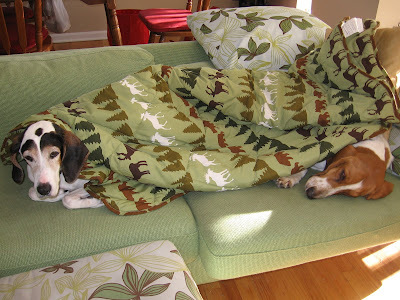 After many hours of careful research, I have determined that blankies are comfortable. 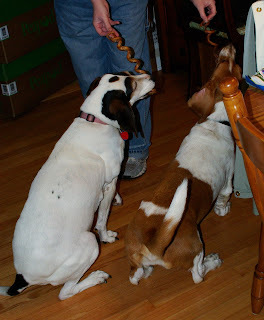 All my doggie pals on twitter are always talking about how great bully sticks are. Some even recorded videos of themselves eating them. 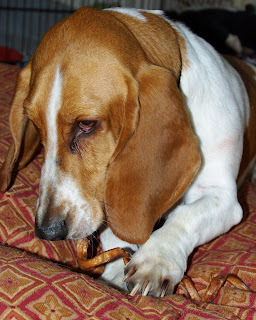 After watching my pals's video, I put the full-court press on mama to order me a bully stick from my pal @BabyPatches mama, @Just4Pets who runs an awesome store. All my begging and demanding finally worked! And now I finally understand what all the hub-bub was about. 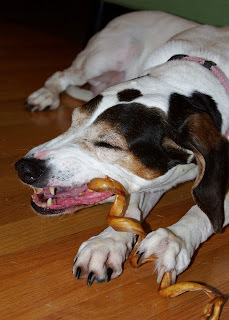 Oh my dog...bully sticks are the greatest treat ever. EVER! 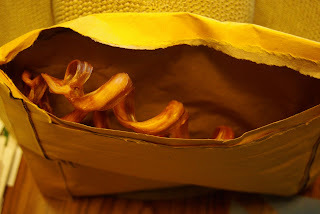 Here is my photo essay devoted to one of my new favorite things. Mama opened the envelope & Mugsy and I immediately started sniffing the air and getting excited. 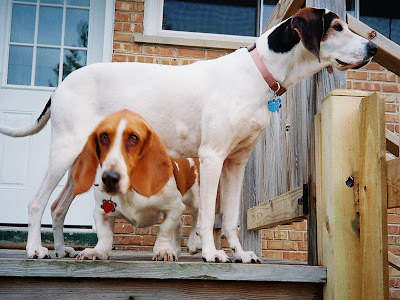 Mama made us sit patiently. 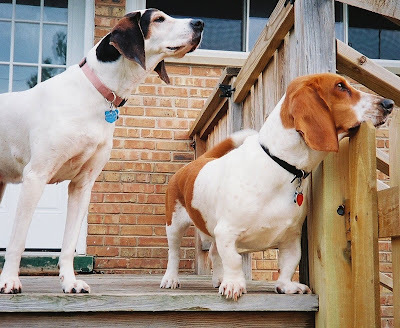 We got right to work chewing on them. I finished mine in 6 minutes. It took Mugsy 15 minutes. 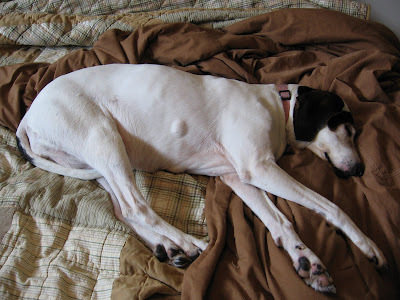 I can't believe it took me 11 years to try a bully stick. This is the best chewy treat ever. 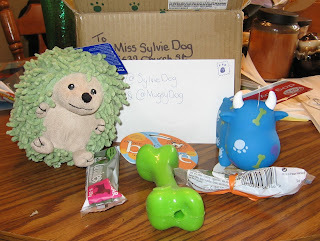 Thanks so much, @BabyPatches & @Just4Pets! p.s. 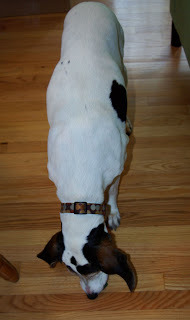 I think Mugsy's bully stick must have been bigger than mine...look at him over there eating & eating & eating. 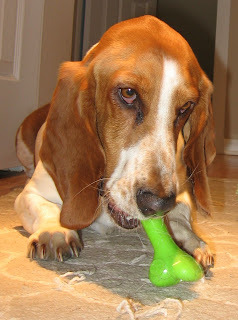 A chance to help animals & win a FURminator, toy, and treats! 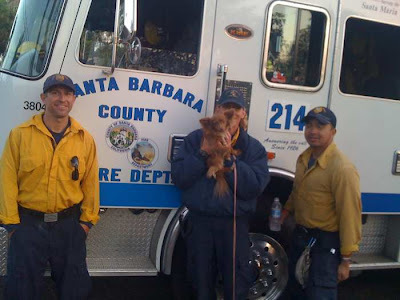 30,000+ people were evacuated due to wildfires in Santa Barbara County last week (including our twitter pal @PeanieWeenie's family - that's Peanie with the firefighters who saved his house). 84 families lost their homes in the fire, including many of Peanie's neighbors. 1000+ animals were displaced by the wildfires and taken in by local animal shelters. And many are still at the shelters as families sort through the damage caused by these fires. 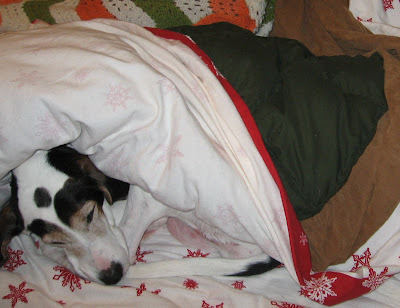 These shelters desperately need our help to care for these animals. 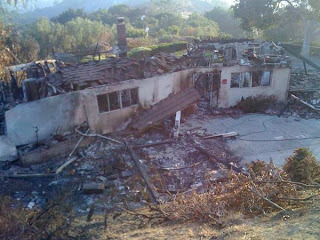 You can help by making a donation via my fundraising page through FirstGiving.com for the Santa Barbara Humane Society. Please give what you can - every single dollar makes a difference. 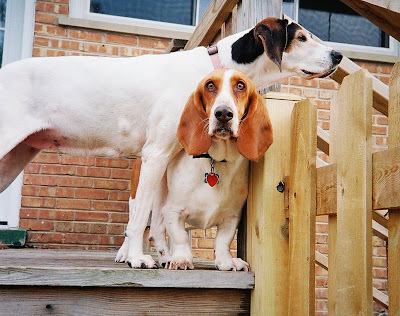 And if enough of us get together and share $1, we will quickly surpass our goal of raising $2000 to help our fellow anipals. *A FURminator de-shedding tool (winner can choose the size). Check out their cool products at http://www.FURminator.com/. *A $25 gift certificate to @LaineysPawtique's etsy store . @LaineysPawtique's mama makes delicious doggie treats, beautiful doggie & kitty beds, and stunning jewely for animals & people. 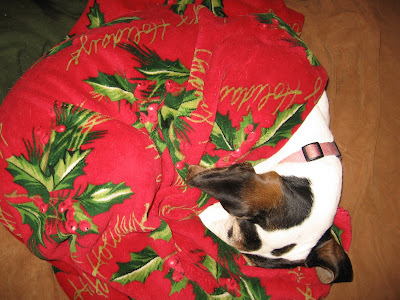 *A gift from @Health4UandPets. If you are selected and you are a kitty you will receive 1 bag of Life's Abundance Gourmet Cat Treats For Healthy Skin & Coat If you are a doggie you will receive 1 14oz container of Gourmet Dental Treats for Dogs. Check out their site at http://www.azjungle.com/. 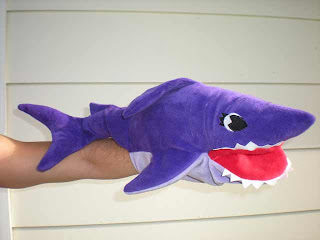 *An irresistible 26-inch interactive Sharkiana toy from @PawPetsDogToys. Check out their store! Thanks for the generous prize donations! To qualify for the drawing, just donate $1 or more and include your twitter name with your donation. If you do not have a Twitter account please leave me a comment that you donated and your name and you'll be entered to win too! Remember, every $1 you donate will help care for animals whose families are dealing with the aftermath of these terrible fires. Thank you so much for your generosity! p.s. Mugsy wants a Sharkiana! 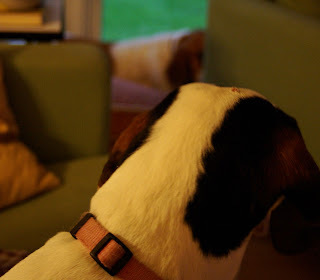 What's Mugsy sniffing over there? Mugsy escapes. I'm still sniffing. 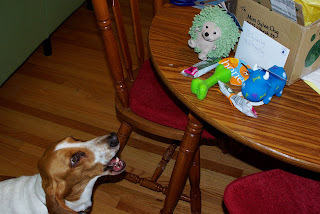 My pal @RadarDog organized a #secretpaws gift exchange for twittering anipals via elfster.com. It sounded like great fun to me, so I signed up right away! And yesterday, I received this fancy package via Royal Mail. Royal! 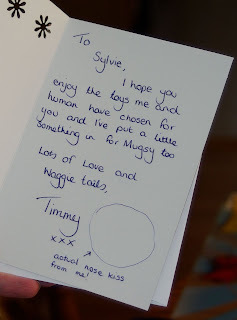 I tore it open and found a sweet card from my buddy @Timmy_Dog (it even had a nose kiss from him!). After I read the card, I started shuffling through the packing peanuts to pull out all my fabulous gifts. Check them out! 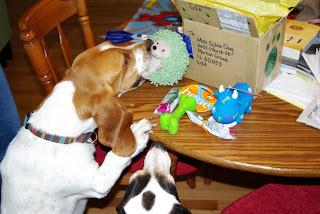 @Timmy_Dog even sent something for my brother Mugsy (so sweet). I was very excited to see all the toys. 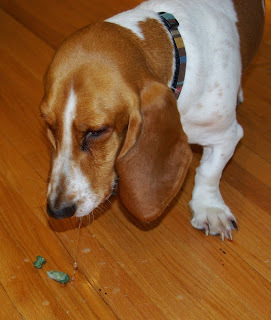 And I was intrigued to see something all my twitter doggie pals are always talking about...greenies! I had never tried one, and it was ever so delicious. 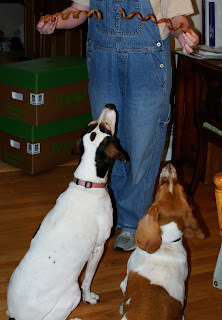 Mugsy loved it too (and got all drooly). After we ate our greenies, Mugsy started eyeing my toys. And then all of a sudden, he grabbed one! 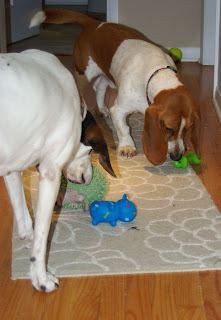 Then we inspected all the toys and played with them. Thanks so much for the awesome gifts, @Timmy_Dog! And thanks again to @RadarDog for organizing the #secretpaws gift exchange. 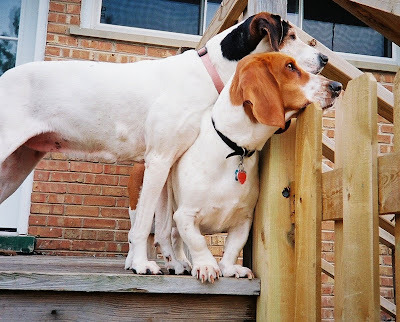 Twitter anipals are the greatest!